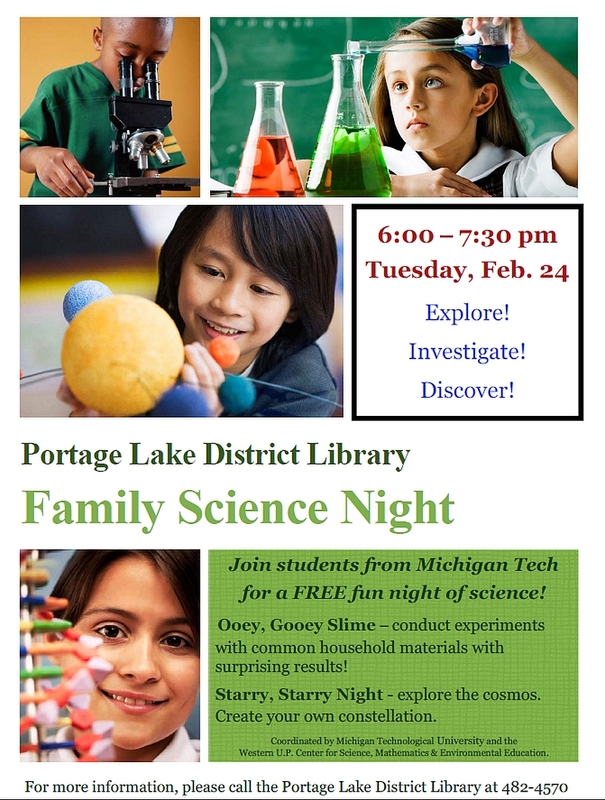 The Michigan Tech Family Science Night Program is teaming up with the Portage Lake District Library to offer a Family Science Night event. The Portage Lake District Library invites all K-6 students and their parents for an evening of fun and science led by Michigan Tech students on Tuesday, February 24, from 6:00 – 7:30 p.m. The library is located at 58 Huron Street on the Portage Waterway. Families will engage in fun hands on chemistry and astronomy activities, such as making their own “Ooey, Gooey Slime” and exploring the night sky. Family Science Nights develop children’s curiosity and their ability to solve scientific challenges, and provides an opportunity for parents and their children to learn together while having fun and making scientific connections to everyday life. This event is coordinated by the Western U.P. Center for Science, Math, and Environmental Education and Michigan Technological University.